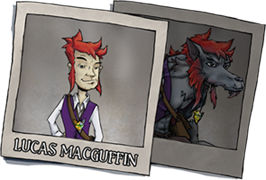 …he then transforms into a muscular, grey werewolf with a red shock of fur – and what’s worse, he can’t take the amulet off! Discovering he’s able to transform between his human and wolf selves in the moonlight, Lucas quickly plans an escape, as a lockdown has been triggered, sealing off the whole city with a high-tech security system. An excellent ex-cop, but booted out of the force when he refused to take part in the massive corruption gripping the city. 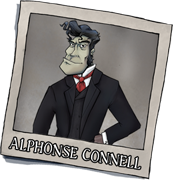 He now works on his own, plotting to expose the beloved city millionaire, Alphonse Connell, for the villain he really is. After catching Lucas about to break into the Museum, he gives Lucas a walkie-talkie to “help” him. He conveniently neglects to mention that he’s using it to keep track of Lucas, too. The local city millionaire, using his wealth to surreptitiously crush his enemies and puppeteer the media, the police, and even the mayor (who happens to be his miserable brother). Alphonse funded Feyre’s citywide security system, so he can conveniently lockdown the city on a whim. He also sponsored the museum exhibit to find the Lupine Twine Amulet, as he was very interested in the history behind it. This might pose a problem for poor Lucas. 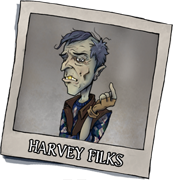 Entrepreneur, opportunist, blackmailer – call Harvey what you like, as long as you give him the cash. 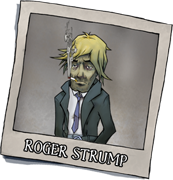 He’s Lucas’ landlord, and has got him between a rock and a hard place. Lucas can’t afford to pay the rent, so he has to do special “jobs” to keep the place – like his latest one, which involves swiping the Lupine Twine Amulet. Lucas can’t even save any money, as rent seems to be conveniently the exact amount of money that he currently has.